We are devoted GSD lovers and have raised German Shepherds since 1976. To produce healthy, intelligent German Shepherds dogs with perfect temperament who are faithful and loving companions. We breed dogs for family dogs, not sport or show. Our dogs are considered oversized. They are large dogs. This is because we have been breeding German Shepherds for 43 years and that is what the old-fashioned GSD used to be - large! They are very athletic and healthy. We are different from most breeders in that our dogs live in many different households - each of our family members (and a few good friends) own a dog or two. That way each of our dogs has its own family, and we do not have ANY "kennel dogs." OUR DOGS LIVE IN THE HOUSE and each one gets tons of attention. Our pups are cuddled and cherished from the moment they are born. Their care starts even before that, as their dam is fed human grade food, carefully exercised and pampered while she is pregnant. Each puppy is handled many times a day from birth. We are often asked if we do temperament testing. Yes we do, although in our own, time-tested way. When you handle a pup for hours a day for eight weeks, carefully observing how it responds to every kind of stimulus, it's pretty obvious what kind of temperament it has. We don't need to pinch it's toes to know if it's a tough pup or a sensitive one. It's our job to know our pups well, and we do. This is also why we pick out your pup for you. When you reserve a pup you tell us about your family and what you want in a grown dog, and we will keep that in mind as the pups grow so that we can choose a pup that will suit you. We know this works because we've had the same clients come back over and over again throughout the years. Ali is a great example of a Black Magic dog. He had never seen a baby until he was 4 years old, but as soon as he saw Luke he became his guardian! 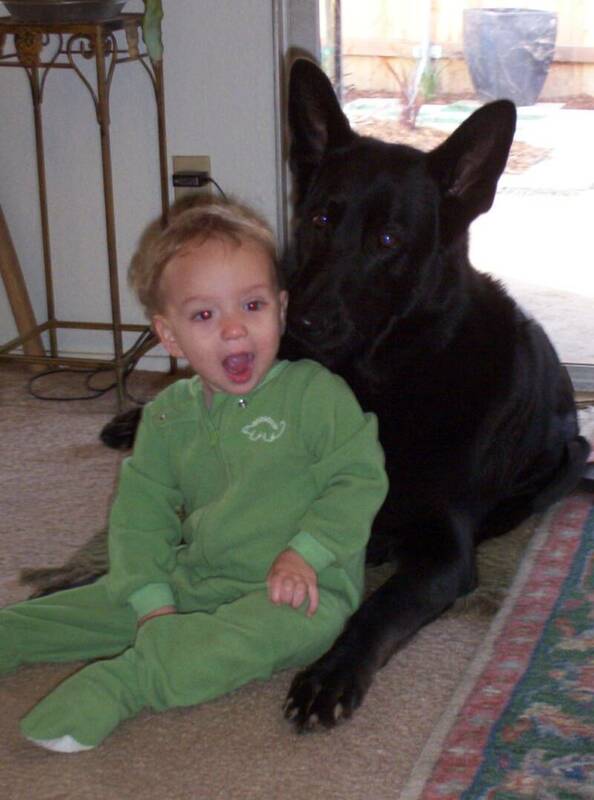 Our goal has always been to produce the dog we believe is the classic German Shepherd; the dogs we raised our kids with from the day they were born. We are a family who raise pups in our home. Each puppy is given individual attention every day. Every sire and dam is evaluated not just for what they are, but more importantly, what they produce. We place utmost importance on health and temperament. Size and outward appearance are never given precedence over those two qualities. Most of the pups we offer now are the eighth generation of our own breeding, which allows us to accurately predict what we will produce. There aren't many breeders that can offer this. In many of our litters, the pup's great great great grandmother was bred by us and lived in our home, as well as every other female in that line. We do produce large dogs, which are considered oversized. But if you look at the GSDs from the 70's, you'll see that we are just continuing to breed those "good old dogs." Our dogs are very athletic and we rarely have reports of ANY health or hip problems. Less than 1% of our dogs have had reported hip or health problems. We test for DM, hips and elbows, and whatever other tests we find. Please realize that feeding an excellent dog food and following our care instructions can be as important as good genetics! We are very particular about the homes our pups and dogs go into. Sometimes folks ask us if they can breed their dogs. The answer is NO. Your puppy will be registered as AKC Limited - which means if you breed your dog you cannot register the pups. Breeding your GSD will usually produce 6-12 pups. Each of those pups can have 6-12 pups. It doesn't take long for 200 pups to come into this world. We take our responsibility to breed and train a limited number of outstanding quality pups as a very serious life's work. If you want to have a litter of pups to teach the kids about reproduction or to try to clone your own dog please give more thought to the number of lives each litter of puppies will affect. Breeding your dog does not guarantee the pups will be just like your dog! Genetics don't work like that. That's why it's so important that we've tracked our dogs for thirty years - we know what we produce.